Are you a part of a medium-sized enterprise or gone through a situation where you worked with a team under a certain time period? Today, I’m reviewing about a software, a time tracking application which will give you what you need. It’s called “Clockodo”. It is developed by Clickbits GmbH. Clockodo is an online software that helps to track your work time quickly, simply and reliably with the help of smartphone clock. You can call it as a substitute for those people who usually use Microsoft Excel or a clock for timekeeping. Traditionally, you need to form a statistic of the work done by you, but this software is itself is a tool which tracks the time and create reports that can be analysed further for other purposes. The reports contain useful information and show how much time is spent, whether it is profitable, efficient or not. As its a web-based application, it can be used anywhere at anytime. Just Login to its website or start its free trial. You will see a dashboard which shows the summary of the time spent on each project. Start calculating the time of beginning a particular task and its ending time, etc. This will provide the exact time details on how long a task has been completed, including time for interruptions and breaks if entered. This app is very productive when you have multiple projects because it helps you to spend the right amount of time on each one to meet the required deadline. If you were using another time-tracking software already then Clockodo can easily gather information and import existing data. Moreover, it can easily export data in CSV format, which is a virtual proof of your working hours and needs to be secured. With the help of Clockodo, you can easily evaluate your scheduled and actual working hours, vacations, overtime and absences. 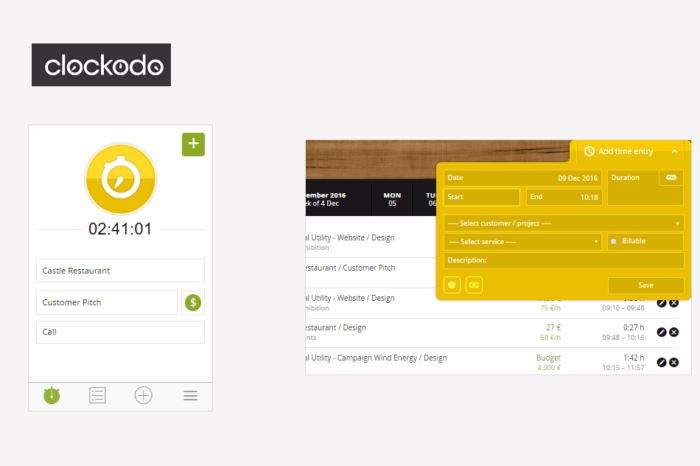 It uses automatically generated timesheets to bill your projects and issue invoices faster. Clockodo does not divulge any data outside the organisation and complies with German data protection regulations. The data is secured in this software and the communication is totally protected by SSL encryption. It helps to increase the company’s profit and worker efficiency by letting others manage their time tracking system. The graphics of this application are just amazing with a user-friendly interface. It is a genius time-tracking software for freelancers and small to medium-sized companies and a software that requires no extra effort to use. Clockodo has a direct impact on the productivity of a company which then affects its profitability. It offers a free 14-day trial of the software. There will be no charge if you want to quit in between the service. Its cancellation can be made anytime, effective at the end of the month. So what are you waiting for! Get your life on track now! It’s available for free on the web. With the help of Clockodo, you can easily evaluate your scheduled and actual working hours, vacations, overtime and absences.